TRS responds to all public record requests in compliance with the Illinois Freedom of Information Act, 5 ILCS 140. Members do not need to submit a FOIA request to receive an answer from TRS. Please contact the Member Services Department, members@trsil.org, to allow us to efficiently respond to your needs rather than submitting a FOIA request. You may request TRS records through the TRS Public Records Center using the link below. This portal provides convenient 24-hour access to request and receive public records from TRS. You will receive an email letting you know when the response to your record request is ready in the Public Records Center. TRS responds within five business days to non-commercial requests and within 21 days to commercial purpose requests. If any records will be used for a commercial purpose, you must disclose that fact when submitting the record request. A request is received on the next business day if submitted during non-business hours. TRS business hours are 8:30 a.m. to 4:30 p.m. CST Monday through Friday. TRS observes all state holidays. There is no charge for electronic records. If you request paper copies, the first 50 pages are free and pages in excess of 50 are 15 cents per page. TRS reserves the right to charge for shipping. Charges may be reduced or waived for requests in the public interest. For commercial purpose requests, TRS reserves the right to charge for staff time gathering responsive records as allowed by law. For in-person record inspection, please contact the FOIA Officer to make arrangements. The Public Records Center is the best way to obtain public records about TRS, but it is not a good way to ask questions about TRS. For questions not answered on our website, please contact Dave Urbanek, Director of Communications, rather than submitting a FOIA request. The following information is provided in compliance with the Illinois FOIA law 5 ILCS 140/4. TRS is the retirement system for educators employed in public schools outside the city of Chicago in positions requiring licensure under the Illinois School Code. TRS administers retirement annuities, disability and survivor benefits as provided in Illinois Pension Code 40 ILCS 5/16 for over 400,000 members, annuitants, and beneficiaries. TRS is a governmental tax-qualified plan under Internal Revenue Code Sections 414(d) and 401(a). The total TRS operating budget for fiscal year 2019 is $34,874,301, which represents less than 0.07 percent of the $52.0 billion market value of the total TRS fund on June 30, 2018. TRS has two office locations. The main offices are at 2815 West Washington, Springfield, Illinois. A regional office is at 4200 Commerce Court, Ste. 101, Lisle, Illinois. The mailing address for both locations is P.O. Box 19253, Springfield, IL 62794-9253. At June 30, 2018, TRS had 188 full- and part-time staff. 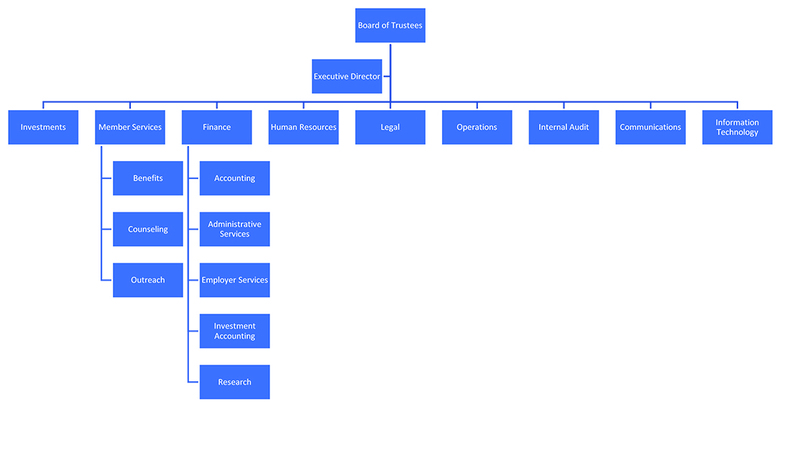 Following is a block diagram showing functional subdivisions of TRS administration. The System’s 13-member Board of Trustees includes the state superintendent of education, six trustees appointed by the governor, four trustees elected by contributing members, and two trustees elected by annuitants. The board is responsible for the general administration of the System. An executive director appointed by the board is responsible for daily operations at TRS.